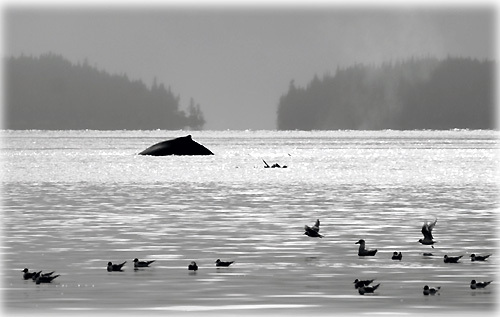 A Humpback Whale, Steller Sea Lions, and Arctic Terns at Settlers Cove. Alaska: Staph infection overblown, officials say By MEGAN HOLLAND - Prisoners are wiping down doorknobs with bleach. Guards are wearing plastic gloves whenever they touch anything inside a cell. And inmates are telling other inmates to go see a doctor when a rash shows up on their skin. Within the walls of Alaska prisons rumors are rampant about the dangers of a drug-resistant bacteria that can cause painful and potentially dangerous skin infections. But medical staff in the facilities say worries about the staph infection MRSA are overblown and want prisoners and guards to halt what they call misinformation. "This is a mirror image of society's response to HIV when it first came into existence," said Roger Hale, a physician's assistant at Palmer Correctional Facility for more than 20 years. "Ignorance causes a lot of confusion and fear." The state Department of Corrections says there have been no documented cases of deaths from MRSA, the acronym for methicillin-resistant staphylococcus aureus. Cases of infections occur, but that is to be expected in a population generally weakened by illness as most prisoners are, said Dr. Henry Luban, the department's medical director. Only one prison guard reported it, and that was in 2006, said deputy director of institutions Bryan Brandenburg. Southeast Alaska: COAST GUARD INVESTIGATING FATALITY AT SEA - The Coast Guard is currently investigating a fatality at sea, which occurred yesterday onboard the fishing vessel (F/V) Zenith approximately 72 miles southeast of False Pass. Alaska: Are Ice Age relics the next casualty of climate change? - The Wildlife Conservation Society (WCS) recently launched a four-year study to determine if climate change is affecting populations of a quintessential Arctic denizen: the rare musk ox. Along with collaborators from the National Park Service, U. S. Geological Survey, and Alaska Fish and Game, Wildlife Conservation Society researchers have already equipped six musk ox with GPS collars to better understand how climate change may affect these relics of the Pleistocene. Business - Economy: Stop overspending By PETER MORICI - The recession is a wake-up call. Americans need to confront some false gods -- free trade, gas guzzlers and Wall Street. In the 1990s, the United States launched the World Trade Organization and opened trade with China. Americans were to import more T-shirts and TVs and sell more software and sophisticated services to a world hungry for U.S. know-how. That would move Americans into better-paying jobs. Unfortunately, the United States welcomed imports with more enthusiasm than China and other developing countries, which kept high tariffs and notorious regulatory barriers to purchases of Western products. America's CEOs and bankers learned how to outsource just about everyone's job but their own -- radiologists and computer engineers joined textile workers among trade-displaced workers. Since the last recession, imports have jumped nearly $1 trillion, while exports are up only about $650 billion. The trade deficit now exceeds $700 billion. Health - Fitness: Studies show air pollution's health toll By LEE BOWMAN - Never mind the air quality in Beijing for the Olympics. There's plenty of polluted air to create some dangerous health consequences for people of all ages right in our own backyards. A steady stream of research sounds the alarms. Just this month, scientists have linked air pollution levels to asthma symptoms and school absences among inner-city kids, increased the number of deaths from pneumonia and premature death from even short-term exposure to ozone pollution, the major component of smog. Bad air even robs people of the pleasure of flowers and honey. Empathy and a referral is in order By Cecelia Johnson - In regard to the offensive "front page article" in KTN Daily News. Although offensive, more importantly, is getting proper help for this individual who has been identified as having a medical problem in the weekend newspaper. - More.. Articles & photographs that appear in SitNews are protected by copyright and may not be reprinted or redistributed without written permission from and payment of required fees to the proper sources.